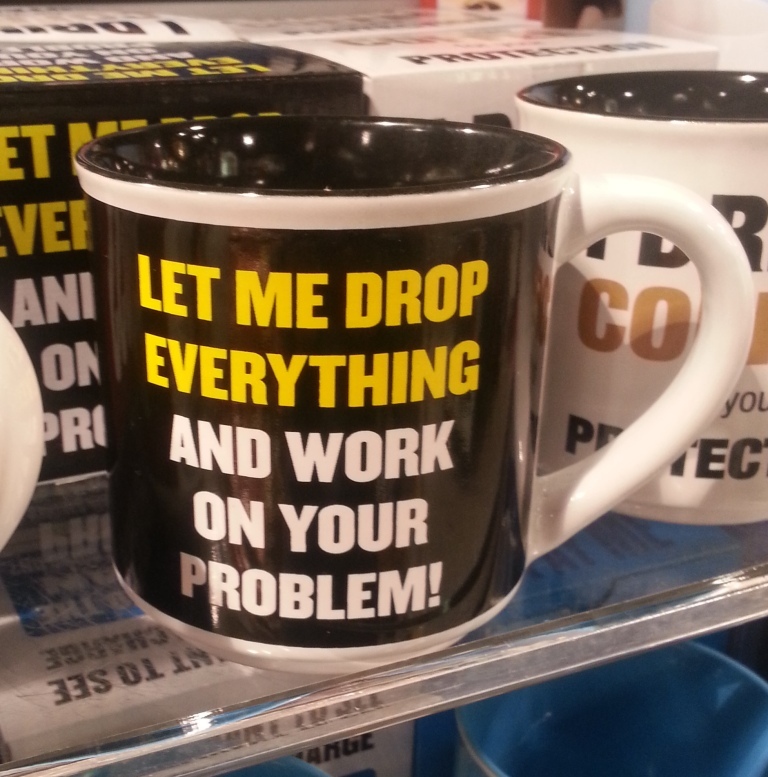 I saw this mug the other day and it made me smile. I suggested online it should be the “official” mug of HR. One of the problems in HR is that we are the place everyone else brings their problems. And historically that was HR’s role I guess. Tea and sympathy, a sympathetic ear, always a box of tissues close at hand. We now live in an age of instant gratification. Customer service means very different things to 20 years ago. When people come to HR they expect an instant response, their problems to be solved there and then. They demand all sorts of different things from us and complain if we don’t deliver or respond quickly enough. I often joke we could be a lot more effective in HR if we didn’t have to deal with people and their issues. I jest of course. The reality is that we can’t drop everything for every single problem and sort it out there and then. What we can do though is make sure the individual feels they and their problem are important, that we will give it our best attention, set an expectation and then over deliver. And that often doesn’t mean solving the problem, but helping THEM find the answer. We are solution finders. It’s not always possible. HR people are busy folk struggling to deal with ever increasing workloads, high stress and fewer resources the same as everyone else. But the good ones care passionately about this stuff and do the best they can with what they’ve got without complaint. If you work in HR and ever find yourself saying “it’s not my problem” then it’s time to move on. Another great post Richard. I think for me (and this is very real right now in my current role), I don’t expect an immediate response, I just expect one in a timely manner and to be kept informed throughout. Unfortunately, I’m seeing a lot of sighing when accepting the problem, rather than refusal, then a real lack of drive to get it resolved. Currently I’m performance managing someone despite HR and that’s just wrong.